Lenhartsville, PA – Boyesen is happy to announce the first of (2) two Outdoor Fever 2 Giveaway winners! Brandon Wilson of Walker, WV has been selected to receive a performance parts package consisting of over $2800 worth of moto related aftermarket parts and accessories for his Suzuki 2004 RMZ250, and has been selected through a random selection process. Congratulations Brandon. You will be contacted shortly. Its not too late to signup to win! The next drawing is to be held on July 31st! "Boyesen and our Outdoor Fever partners recognize that the cost of racing is impacting racer's efforts so we put together a program that is designed to give a helping hand with keeping your bike in top performing shape," - Boyesen Marketing Director, Dag Boyesen. Catch Outdoor Fever 2 today! 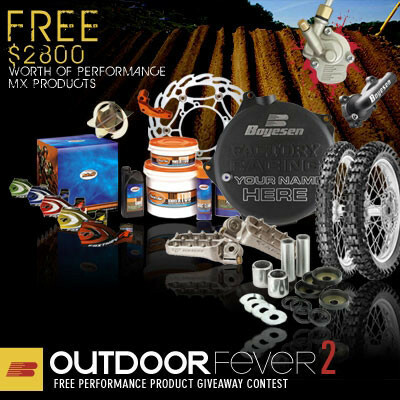 Continuing until July 31st, the Outdoor Fever 2 Partnership is giving all riders one last chance to win a performance parts package from Boyesen, All Balls, Pirelli, Twin Air, Moto Masters and Fastway. Simply go to the online signup page, fill in your contact info and submit - it's that easy! The final Outdoor Fever 2 drawing will take place on the following date: July 31st. The last winner will be announced online in press release format. Visit http://www.boyesen.com/Giveaway_09.html and catch Outdoor Fever today!